Happy Dussera to all Sai Baba Devotees Across the World !!! When the oil of the span of life finished, the fame of life dimmed. The body found rest on the lap of Bayaji (Appa Kote). He did not fall on the ground nor did He lie on His bed; but sitting quietly on His seat, doing charity with His own hands, He threw off the mortal coil. Nobody know Samarth’s mind or heart’s secret. He left the body in no time and became one with the Supreme Spirit. Wearing the cloak of the body, from Maya, the saints manifests in the world. Soon after their work of upliftment is completed, they merge with the formless. An actor plays many roles; but fully knows his own identity. Those who manifest themselves, resume their own identity after their work is done. What is death to them? He Who manifested for the benefit of the people, ended the Avatar as soon as His mission was complete. Could He be bound by life and death, Who takes a form by His Own Divine sport? How can there be a possibility of death for Him Whose glory is the Supreme Spirit? He Who is the embodiment of detachment, how can existence or non-existence have any effect on Him? Though ostensibly He appears to be engaged inaction, He hardly ever performs any. Being without any ego, when doing any action He believes that it is not He Who is doing anything. “Action does not end without experiencing its fruit”. This is the essence of action as implied in the Smritis. There is no delusion in case of the knower of Brahman, since He sees Brahman in every entity. This is the fruit achieved on account of a collection of deeds. Such a duality is well-known; but here, too, the knower of Brahman believes it to be Brahman, as a silver sheen on the oyster. How could Baba, like a loving mother, fall prey to death? It was as if the day was eclipsed by a dark night. By kindling their own luster, saints extinguish their own bodies. Baba did the same with His own hands. What should never have happened, had happened! Maharaj became one with the Supreme Spirit. The people were dispirited, sobbed and whimpered. Sai Samarth, the Cloud of Bliss, Who did not know about the birth of His body, how could His body experience death? He does not know about the body’s existence. How could there be birth or death for Sai, Who is Parabrahma Himself? Knowing that Brahma is Truth and the world a mirage, how could He have body consciousness? Taking on life or abandoning it, or roaming the space formlessly, is done at will by the power of Yoga, for the benefit of the devotees. The body is merely a burden. How can they have pain or suffering? If they have any, it is because of the bonds of ate. But, they are not concerned. “The sun has been eclipsed and has disappeared completely,” say the people. But, it is merely the fault of the sense of perception. The death of saints is likewise. He Who manifested because of the past meritorious deeds of the devotees and was filled with devotion invisibly, he appeared for the welfare of the devotees. It was then that He was perceived in Shirdi. It was said that now the work of the welfare of the devotees was completed, and, therefore, He abandoned the body. Who will place faith in these words? What is life and death for a Yogi? Sai Samarth abandoned His body as per His own will and burnt the body in the ‘Yoga Agni (fire)’. He became one with the unseen, but remained eternally in the hearts of the devotees. How can He die, the remembrance of whose name breaks the cycle of life and death for others? He attained His earlier Invisible Self. Going beyond the gross state, Baba became one with the unseen, where He enjoyed being one with God. But, always He keeps the devotees alert. He Who throbs with the Supreme Spirit and is permanently engraved in the hearts of the devotees, then how could His body be said to have ceased to be. Such words are unacceptable. Therefore, this Sai Who is without a beginning or an end will ever be there until the ‘Pralay (deluge) of the world. ‘One has experiences commensurate with one’s faith; even today. When the power of this axiom exists for Him, how can there be death for such a one! He, Who espoused the causes of the devotees, has abandoned His body in Shirdi and is all-pervasive with th movable and the immovable. He is capable of taking Avatar again. ‘Now what is there in Shirdi, as the Samarth has mingled with Brahman?’ have no such doubts, as Shri Sai is beyond death. Saints are not born (from the womb). They manifest themselves for obliging others. They are the embodiment of Brahman. Only the fortunate ones so manifest. Those Who are incarnate are never born and They never die. As soon as Their mission is completed, they merge with Brahman and become one with the unseen. A body is of a three-and-a-half hands’ length. Could Baba be said to be contained in that? It is improper to say that He was of a particular size, shape or colour. Even otherwise, for Him Who is a store of knowledge and is always one with the Supreme Spirit, to take care of the body or to leave it is the same. Are you confident that our Sai is this gross skeletal body of three and a half arms length and the senses? Remove this doubt forever. If one is to call that body Sai, then there is no name for the one who is free from all bodily and earthly enjoyments and pursuits. There is no form for it. Shri Sai is beyond a form. The body is perishable. Brahman on its own is indestructible. The body is included in the five elements; but Brahman is without beginning or end. Observe the Pure, Excellent Self, the Supreme Being, and the Life Spirit, which animates the gross senses. Sai is the name for that. He transcends the senses. The senses are gross and do not know That. It is That which animates the senses and activates them with ‘Prana’. The name of the power is Sai. There is no place without it. It fills the movable and the immovable. It is this that has taken Avatar. Earlier it was unmanifest. Taking a name and form and becoming an individually, it became manifest. After accomplishing its mission, it merged into the unmanifest. After achieving the work of the Avatar, the body taken for the Avatar is abandoned and enters the abode of the Knower and the Known, Sai acted in this manner. Actually, it is nothing to be surprised about. This Sai is beyond birth and death, and has only left the body. He remains without form, as earlier. The body has gone and the form has gone. The spirit lives as before. The Leelas, after He left the body, continue to occur. Everyone knows that. While meditating, there should be intense concentration. There is no better means than mediation. He who practices this himself will undoubtedly uplift Himself. How can there be life or death for him who has forgotten the desires of life and the world? He achieves bliss by being engrossed in the Atma. The great souls who transcend time and space, can their life span be exactly calculated? It is a formidable task. The great souls are existing in their own orbit. They are neither born nor do they die. How can the sun rise or set when in reality it is steady and immovable. It is that Self which is complete and is without birth and death, and about whom the sages always say that you cannot achieve permanent good without its attainment. Parabrahma is knowable. Apar Brahma is attainable. Aum, their sign is their symbol to be meditated upon always, and to be worshipped forever. That is the Aum – a word, a sentence, a letter which is the essence of all Tapas. By the very utterance the meaning is revealed, and constant repetition gives enlightenment. It is that all-pervading consciousness. It neither grows nor decays; because it is immutable. Rare is that ardent devotee of his Sadguru who understands his Atman to be such. The Atman is unique. It is separate from the body, the sense organs, the mind and Prana. It is self-illumined, pure consciousness, not subject to change and without form. That which is devoid of the cognition of ‘Sat’ and ‘Asat’ etc. from any idea of gender and is bereft of all attributes is verily the all-encompassing. Nature of the Preceptor expressed in the form of different words. Atman is without any attributes, beyond old age, birth or death. It is ancient and eternal, indestructible and beyond decay. It is perpetual, unborn, ancient, all-pervading like the sky, unending, and indivisible, ungrowing and unchangeable. Then who can describe that which is beyond words, without form, without beginning or end, unfathomable, imperishable, without smell, without taste and untainted. Thus, this Atman which is attributeless and invisible and is not known because of ignorance. Then remove this ignorance by knowledge. But, do not ever call that Atman non-existent. Beginning from Brahman (the permanent and immovable) and ending with all immovable objects, Sai Himself is manifest everywhere. Sai, being kind, imprinted (on all minds) that God exists in all creatures. Though (Sai), Your corporal form is invisible to us at present, yet if there is faith and devotion, the devotees get living experiences. The spirit in the Samadhi is awakened and becomes instantaneously visible. In the same way, indeed, that throbbing of reality which goes beyond the three aspects viz. Sattva, Rajas and Tamas, is really the form of the One embedded in the heart. That state of being without names and forms which remains as the essence of Your own is really the indication of that One, embedded in the heart. Knowing this seek refuge in Him. He who breaks the ties of previous birth and death, snapping them angrily, to Him I, the dull-witted and the ignorant, bow with eight-fold prostrations. 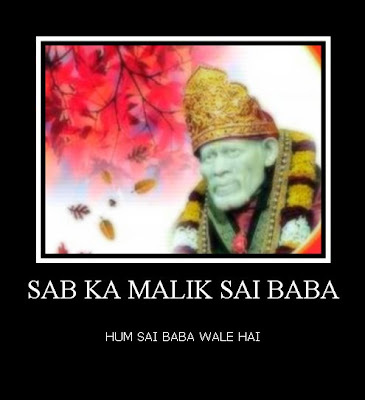 You have written a fabulous article with Sai's grace !! !